This is a rough outline of the proposed regions. This is by no means final. I was initially suggested that the northern region containing Northpoint, and the western region containing Camlorn, be their own separate regions. Separate from the Illiac Bay and Wrothgarian Mountains. A name for the two regions has yet to be decided. [horizontalline][/horizontalline]* Appears on base map. For some reason I always thought that the western coast of High Rock was called the Eltheric Coast. Of course, depending on the geography, the region can be titled something with "moor/moors" in the name as a nod to TES2. I hate the very fundamental concept of ESO, but its name for the Northpoint region has always struck me as interesting, Rivenspire. Not sure why and it doesn't really say much about the geography, I liked it. The rest of the game I could do without. Also, not sure anyone else will agree with this, but rather than the coastline being called the Iliac Bay region, wouldn't it make more sense to have just the cells full of water between High Rock and Hammerfell be considered the Iliac Bay and have the coastline be named something else? One final nitpick. Bjoulsae River => Bjoulsae River Valley? Out of curiosity, was a Hammerfell height map developed that matched up to the borders with High Rock 427, SHotN, and P:C as well? Jet133 wrote: For some reason I always thought that the western coast of High Rock was called the Eltheric Coast. Of course, depending on the geography, the region can be titled something with "moor/moors" in the name as a nod to TES2. Yeah same here. I see nothing I like at all really. I hate to be so negative, but it is a real shame. Everything about it is just so wrong. Jet133 wrote: Also, not sure anyone else will agree with this, but rather than the coastline being called the Iliac Bay region, wouldn't it make more sense to have just the cells full of water between High Rock and Hammerfell be considered the Iliac Bay and have the coastline be named something else? Most definitely. It always seemed odd to me, but ive never really had any outsider input if you see what i mean. Jet133 wrote: One final nitpick. Bjoulsae River => Bjoulsae River Valley? Sounds better yeah. I kind of want to avoid the word region at the end of every regions name. "Bjoulsae Valley" or "Bjoulsae River Valley" both sound good to me. Jet133 wrote: Out of curiosity, was a Hammerfell height map developed that matched up to the borders with High Rock 427, SHotN, and P:C as well? Yep. Out of all the height maps I made, the High Rock - Hammerfell border connected best. As they were pretty much the last I worked on. The ones before all started out as flat planes and never really got a proper treatment. All the province landmasses line up perfectly, just not height wise. Is Shornhelm supposed to be Shedungent, where the agent (you) finds Nulfaga? Shornhelm isnt in TES 2. Look at any map of Tamriel or High Rock. SGMonkey wrote: No, not at all. Yes, Shornhelm isn't in TESII but after the Warp, i.e. TESIII and IV's timelines, Shornhelm does appear in the map. No... Shornhelm doesn't appear in TES II because the playable area of Daggerfall doesn't encompass the entirety of High Rock. The Warp has nothing to do with it. Bumping this thread. I plan on posting flavor/description writings for the settlements and regions as the group and myself come up with them. These aren't meant to be concrete but more general ideas that can be explored. The city of Wayrest is the richest and largest city in High Rock along with the whole northwest of Tamriel. It is located at the mouth of the Bjoulsae river and has thrived off of the trade generated there. Wayrest is a hotter city than most settlements in High Rock, being blasted with warm air which travels north up the coast of Hammerfell over the Illiac bay. Bricks are often used in the Gabled roof houses in an arrange of bright shades of red, white and grey. Wood and straw are not common in Wayrest architecture. Grand boulevards, aromatic markets and exquisite gardens are a common sight in the city; dividing the merchant west, royal east and noble north from the docks to the south which house the poor. The royal estate itself takes up the entire east quarter of the city, including a monumental palace and expansive private gardens. Wayrest is known for its affluent merchant culture, filled with merchant princes who some would say have more sway in the kingdom's politics than the large majority of nobles. The way to power for Merchants is easier than it is for nobles, simply amassing wealth and trade deals will attract the attention of influential people. With enough resources nobles and knights can be bought off, affording the merchant all the privileges available to the noble class without the hassle of maintaining ones status. Trade deals are very valued, however, and those who look to create monopolies will often resort to extreme and savage measures to eliminate their competition. The Noble class is vast, having over a hundred noble houses and knight houses which is extreme even by High Rock standards. Becoming a noble or knight in Wayrest is not as hard as it is in many other cities because in Wayrest high ranking nobles can grant this title independent from the royal family. This has created a vicious court, however, for there are not enough privileges and claims to go around. While some nobles with connections and cunning are able to amass large tracks of land and titles, others are left with nothing but their family name which is not worth much in Wayrest. House histories are not valued here, every noble must fight to retain their family's holdings or risk losing them to a craftier opponent. The commoners are quite destitute in the city of Wayrest, their labor competing against the massive and cheap imports flooding into the city. Whether it be crops from the reach, clothing from Evermore, pottery from Hammerfell, wood from Glenumbra or even silk from the Niben, all things valued in Wayrest come from some place else. This leaves the commoners will little choice but to work as sailors, fishermen or even criminals to survive. A large criminal network has formed over the long history of Wayrest, being utilized by the merchants and nobles to achieve their ends. It is said both the Assassins and the Thieves of High Rock organize here under guilds and brotherhoods in order to commercialize their trade. The guilds and temples of the Empire can be found in Wayrest, as common as they are in any Cyrodiil city. The Mage Academies of High Rock had long ago at the start of the third era joined under the administration of the mages guild as part of the agreement that brought the province into the empire. This joining has wavered in recent years, however, threatening to splinter the Mage Academies apart like they were before. It is said that the Mage Academy of Wayrest has long been plagued by outside influences playing a intimate role in it through secret funding. The kingdom has also had a recent increase in the popular mercenary guilds of Illiac bay, centered on its new satellite city Dwynnen with its infamous Ravennia hirelings. The ethnicity of Wayrest is wildly varied, containing multiple races and subraces from all parts of civilized High Rock and beyond. Any are welcome in Wayrest so long as they have the skill or coin to make it in the city. The Redguard population in Wayrest is among the highest of the High Rock cities, a large number of the lesser merchants and sailors being among their kind. 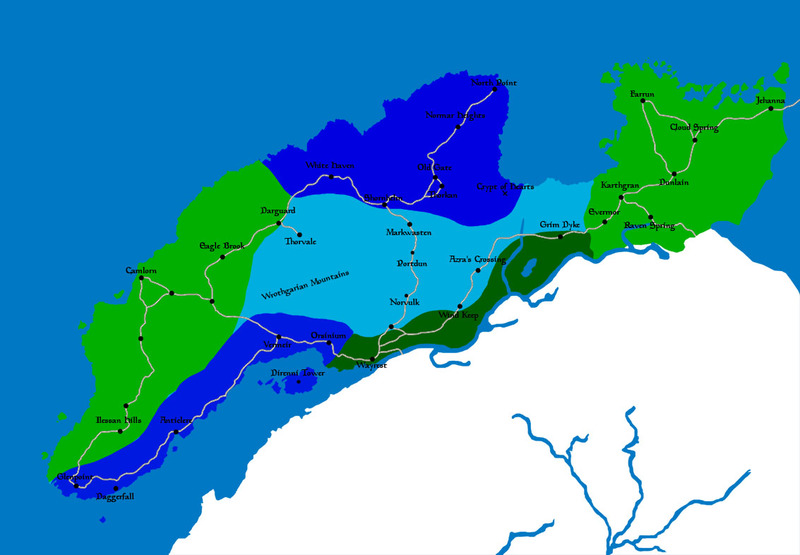 All Breton subcultures are found in the city, making up the majority of the citizenry. Other races from all over Tamriel have chosen to settle in Wayrest after their ancestors (or selves) were drawn to the promise of opportunity the city radiates. While some find their fortunes others are eaten up and spat. Some Orsimer have begun to settle in the south side of the city or along its outskirts, trying to earn a septims for themselves or even their clan back in their homeland. This possibility was opened up by the recent alliance between Orsinium and Wayrest. Though many in the city still fear and despise the Orcs, the ruling forces have allowed the immigration of Orsimer into their ghettos. Daggerfall is one of the oldest settlements in High Rock, considering itself the cultural and historical capital of the Bretons. 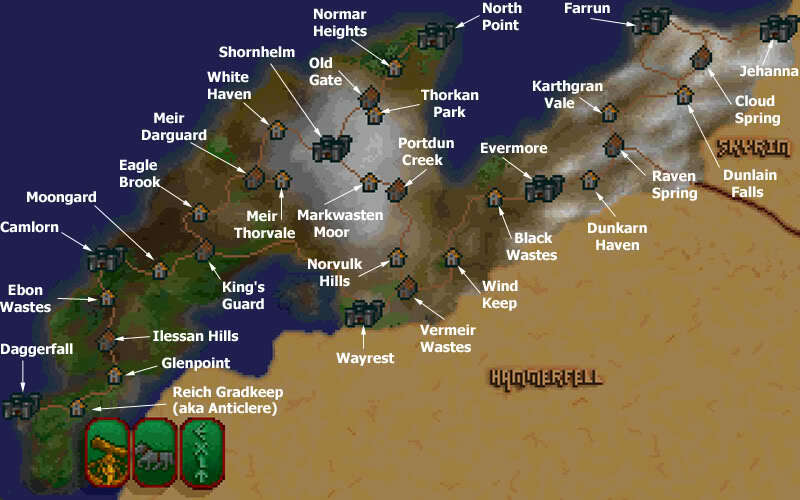 Daggerfall is also legally treated as the Imperial capital of the province since its annexation into the Empire. 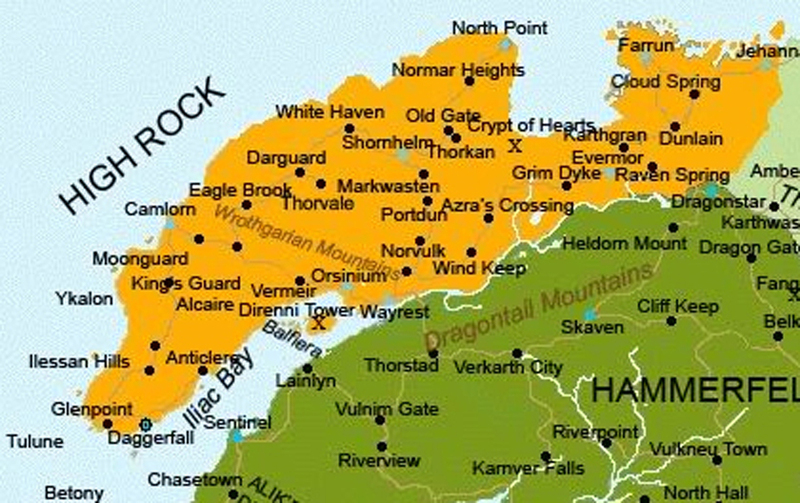 Daggerfall is one of the great ports of West Tamriel, only truly surpassed in High Rock by their cousin city Wayrest. Daggerfall is a temperate city, most of the time displaying calm weather but is famous for being hit by furious storms. The roofs of Daggerfall houses are guarded and built for strength, the houses made from dark grey stone and dark wood from Glenumbra. Despite not being as large as Wayrest, Daggerfall boasts a larger population with every last corner of the city packed with houses and shops. In Daggerfall's north dwells the modest fortress castle of Daggerfall along with the garrison of the knights of the dragon. The middle of the city houses a large temple to the god Kynerath as well as the main markets of Daggerfall. To the south there is the grand Thadorian Academy of mages as well as the city cemetery. The East and West are dominated by small shops, manors and houses placed in an unorganized fashion of narrow alleys. The center of Daggerfall from North to South is divided by a large street. Outside of the city walls to the North, East and South are fishing huts and the docks. Daggerfall's nobles are of old blood, tracing their lineage back to the years of the First Era. These nobles were once part of clans which battled for dominance in the old kingdom. Long ago the territories of Daggerfall, much smaller than its current holdings after the warp, were almost in a constant state of rebellion. Dynasties of battlemages and witch-kings fought over every rock and hill, determined to become the reigning clan. By the second era, however, Daggerfall had calmed to a more stable state. The clans had become houses and the houses served the royal dynasty. The current royal family has been in power for hundreds of years and their dynasty has been supported by many powerful forces. To become a Knight of the Dragon is fairly difficult; the individual must show the utmost loyalty to the kingdom as well as the king himself. Becoming a noble is almost impossible without marrying into one of the already existing houses. There was extreme turmoil after the Warp when King Gothryd revoked the privileges of the noble and knight houses of the kingdoms he absorbed. Some were able to earn back some of their titles and lands by showing fidelity to Gothryd but many others did not. The middle class and commoners of Daggerfall have largely live stable and comfortable lives for generations. Families with trades and property have continued to provide goods and services without incident, while the commoners fish and farm in peace for their lords. Daggerfall is moderately self reliant, most of the city living in a closed ecosystem with only the luxury goods of Nobles and upper class needing to be imported. A foreigner may find it hard to make a living in Daggerfall, however, due to needing to have connections or history for most things in the city. With the recent annexations Daggerfall gain from the warp, however, for the first time in hundreds of years there is opportunity for upward mobility and fortunes as the city opens up to its new holds. The docks of Daggerfall, however, are a different matter; resembling the wild ports of many of the other Illiac bay cities. The denizens of the Daggerfall docks are even more exotic than those of Wayrest, including Dres from Morrowind, Khajiit from Elswyr and even Sloud from Thras. The law is weak on the docks creating the perfect environment for one of Tamriel's largest blackmarkets. Daggerfall has historically kept these elements out of their city but abided their presence for the lavish gold the trade provides. Gothryd, however, has recently made an effort to crack down on the docks to stamp out crime and deceit. He has gone to such extreme measures as to banning certain races from the docks and threatening criminals with donating their bodies to necromancers after they are executed. The city of Evermore is one of the newer Breton cities in High Rock, only tracing its roots back to the mid second millennium of the first era. It is said that with the fall of the Altmer in High Rock, rouge Breton Wizards nostalgic for the rule of the Direnni formed together to create a bastion of elven culture in a land they preserved as becoming more and more barbaric. After hundreds of years and the installation of a monarchy, however, Evermore achieved their own cultural identity. The city is located in a very temperate and pleasant climate surrounded by small rolling hills. The city itself was founded on the heights of hills overlooking the Dragonfields to the east. The east side of the city has a massive palace with five towers rising from it. The north is occupied by houses and shops while the south includes the temple and manors, separated by a grand walkway and garden. The west side of the city houses the evermore magical academy and its estates. There is no natural entrance to the city which is walled off on all sides, one must either levitate over the walls or use the teleportation pad outside of the city on the west side. Many have been black listed, however, including the poor who were long ago banished from the inner city and now live around the exterior pad. The nobles of Evermore are synonymous with the wizards of Evermore, the two being one and the same. The factions of the city are full of overlaps, the nobles of Evermore being members of the Order of the Tower who associate with the Evermore academy who work with the temple of Julianos. Many of the institutes all work in to the same goals of advancing the prosperity and power of Evermore and are partitioned into order to delegate tasks. One might see this as an unstoppable force but in reality personal egos and politics often get in the way of the system running smoothly. Each hedge-wizard is out for themselves, seeking greater positions of power to increase the resources they have at their disposal. Any wizard in the sphere of Evermore wants to be granted a position in Evermore where there is the most knowledge to be had, it is said that the less promising members are stuck manning wizard towers in the fringes of the kingdom's domain. Evermore has had a vicious rivalry with the Gwylim university who has pouched some of Evermore's finest minds and scholars for thousands of years. Anticlere is an old city but has a new name, renamed after Lord Flyte took rule as regent. Its original name is Reich Gardkeep and was one of the first nord settlements in High Rock. Much like Daggerfall, however, it was quickly incorporated into the Direnni Hegemony during its reign. There is little left of the Nord or Direnni in the city but the library of Anticlere has Direnni influences. The architecture of the city is largely made up of white and grey stone and flat roofs are common. Anticlere has long been considered a neutralist nation, staying out of the wars and disputes common to the Kingdoms of High Rock. It is largely lived in by Bretons but the city has large Redguard and Mer populations. Under the new rule of Wayrest and the timely death of Lord Flyte, the city was placed under the command of a governor. Like most of the new Wayrest territories, the knight orders and nobles were allowed to keep their privileges and encouraged to unify peacefully. The Knights of the Flame now dutifully serve Wayrest as a branch of the Knights of the Rose. Dwynnen is a city dating back to the early years of the second era, founded by a group of witchhunters as a base of operations in their campaigns into the skeffington woods. The city has continued the traditions of rangers with their Order of the Raven, who famously led the battle against Cameron the Usurper. Dwynnen is located on a rocky crag at the edge of a small cove. To the North is the forested fields of Ravennia, to the West the skeffington witch-wood, to the South is the waters of the Illiac and to the East are the old tombs of the Witch-kings. Dwynnen sports gothic architecture, with fenced walls and bridges to connect the crag summits to one another. They use grey and black stones. The city is famous for their mercenary guild, multiple troops banning together for protection and price fixing. It is said that the mercenary guild is controlled by special interests for unknown purposes. The master ranger general, Baron Othrok, had his line end years before the Warp after which the city was ruled by a council of nobles. Under Wayrest's rule, however, the city is ruled by a governor much like Anticlere. Glenpoint is a city on the border of Glenumbra and Ilessan Hills. The city is famous for being near the site of the Battle of Glenumbra Moors, where the Alessians faced the combined armies of the Nords, Direnni and Aylied. Glenpoint has a very poor population who live off of the meager fields the city controls and wild life of the moors. Little more than the castle, orderhall and temple are made of proper stone, the rest are of thatching and wood. The city is festering with crime, said to be the hotbed for the thieves guild of High Rock. Glenpoint is so involved with the thieves guild it is said that nobility itself are members. Due to their impressive spy network, Glenpoint was able to predict the clash of nations that would occur leading up to the Warp and wisely declared for Daggerfall before the chaos started. This allowed them to gain Gothryd's favor which meant keeping most of their privileges, their knight order as well as much of their autonomy.